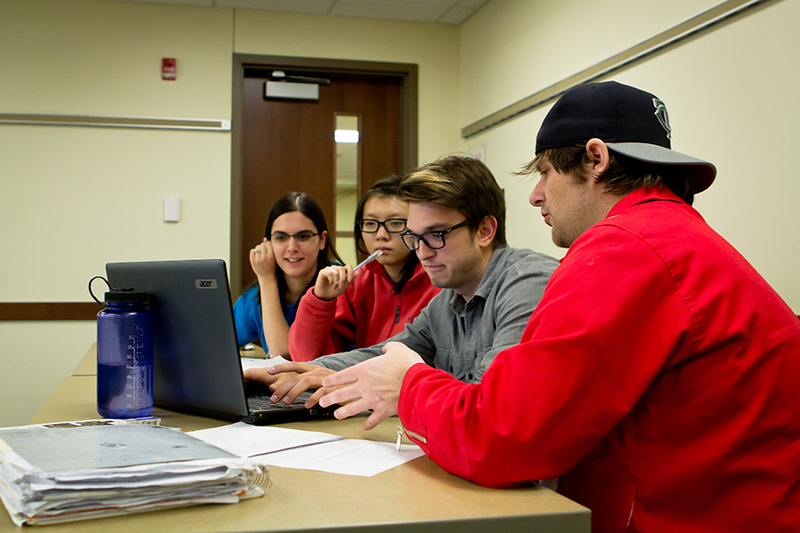 Social work students plan community outreach efforts Thursday night in Lommen. Adjunct social work professor Tim Erhardt’s class focuses on increasing awareness of homeless youth in the Fargo-Moorhead area. Erhardt uses the community as his classroom, where his social work students experience working with organizations in the Fargo-Moorhead area. Three main projects encompass Erhardt’s course curriculum. All three involve choosing an underrepresented group in the community in order to help spread awareness and educate others about the group. Erhardt thinks it’s important for all students to continue helping underrepresented groups in the community, even after they graduate and work in their chosen fields. Erhardt and his wife developed an international nonprofit called the Jua Project in Kitale, Kenya. The nonprofit creates jobs for single women by teaching them how to create jewelry out of recyclable materials. The jewelry is sold in the U.S., which creates a weekly paycheck for the women to help them break the chains of extreme poverty. A group of students are working with the Jua Project. Erhardt assigned a punk rock band to each group of students to research the issue they advocated for. Joel Kromer, Jess Long, Cassie Webster and Jo-Wei Kao are senior social work majors who were assigned the Dead Kennedys, a band formed in San Francisco in 1978. From this band, the group decided to advocate for the homeless youth in the F-M area. On Thursday, this group of students will be at a table on the first floor of the Comstock Memorial Union, aiming to spread awareness about the homeless youth issue. They urge people to stop by and learn more about the issue and ways to get involved. The group of students explained the community does not see a shelter for homeless youth as a big need in the community, because they want the nuclear family to be a norm. However, the community should know the nuclear family is no longer the norm, and factors such as drug, physical or emotional abuse by family members or others can cause a child to run from home and, therefore, need shelter. Kromer read from a study done by Wilder about homelessness in Fargo and Moorhead. Even though the numbers are small, this still leaves an average of 19 children without a place to go. The community can assume there are more homeless unaccompanied minors in the area who are unaccounted for; many who may be finding places to stay through Couchsurfing, Craigslist or the streets. This group of students have positive reviews when discussing Erhardt’s class and the opportunities they’ve had so far to help the community.